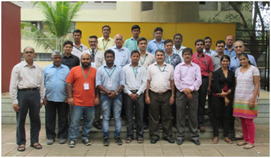 Topic : "Entrepreneurship in Waterproofing, Structural Protection and Repair of Concrete Structures"
Dr. Fixit Institute organized a first-of-its-kind Training Programme for International applicators from African and Asian continents on “Waterproofing and Repair Materials Applications” on Feb 29 – March 3, 2016 at Taloja plant, Navi Mumbai. 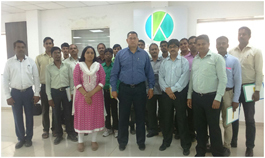 A total 23 applicators from Kenya, Nepal and Srilanka attended the programme. 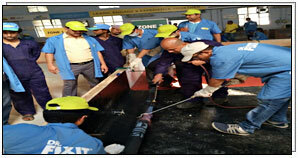 The entire programme emphasized on detailed hands on training with waterproofing and repair materials such as Injection grouting, structural strengthening, crystalline waterproofing, epoxy flooring etc. 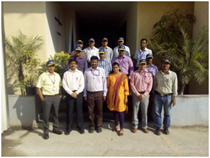 Mr. Sanjiv Dutta and Mr. Sushant Bhagat from International marketing team of CC division drove the initiative. The programme was well supported by the entire international CC team and Mr. Tirtha Pratim Banerjee, Ms Seema Samshette from DFI. 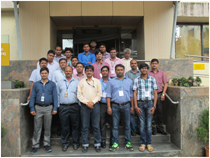 The programme successfully completed with much appreciation from the participants. 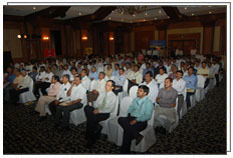 Venue : Pidilite Industries Limited, Plot 19, Taloja plant, Navi Mumbai. 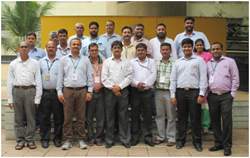 Apart from the above initiative, Dr. Fixit Institute continued its knowledge spreading activities for awareness in “Waterproofing, Building Maintenance and Repairs” by organizing a series of programmes, technical sessions and elective courses across India. 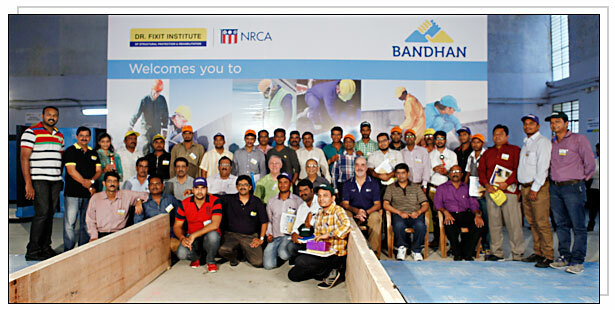 Dr. Fixit Institute organized a first of its kind Training Programme on ‘Train the Trainer on Waterproofing Applications’ bringing two eminent trainers Mr. John Schehl and Mr. Bill Steinmetz from National Roofing Contractors Association (NRCA), USA on 17-21 November 2015 at Taloja, Navi Mumbai. 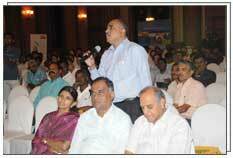 The programme was inaugurated by our CEO Dr. Sanjay Bahadur and supported by other senior officials from CC Division. 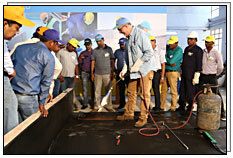 The entire programme emphasized on hands on training with waterproofing materials and systems including flashing systems, detailing at pipe penetrations, inside and outside corners of protrusions etc. 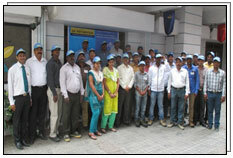 32 participants from Nina Waterproofing and Percept Waterproofing attended the programme. 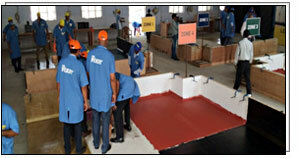 The challenge of the programme was to organize right from creating the training floor area at an un-used plant location, designing and building up the large mock-ups, arranging tools, equipment and materials, organizing all the support services including branding, training kits, stay and food arrangement for participants etc. within a time span of only 30 days. The core team comprising of Mr. Tirtha Pratim Banerjee, Mr. Dinesh Rajput and Ms Seema Samshette supported by other vertical heads and team members drived the initiative and accomplished it with high applause from the participants as well as the international trainers. 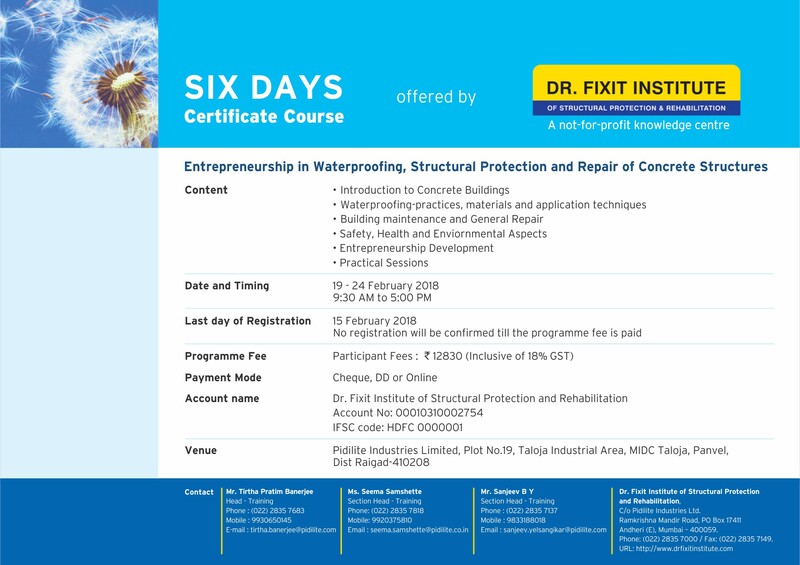 Apart from the above, Dr. Fixit Institute continued its knowledge spreading activities for awareness in “Waterproofing, Building Maintenance and Repairs” by organizing a series of programmes, technical sessions and elective courses across India. Locations : Delhi, Hyderabad, Mumbai, Paradeep. 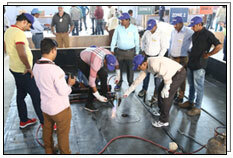 Dr. Fixit Institute continued its knowledge spread activities for awareness in “Waterproofing, Building Maintenance and Repairs” by organizing a series of programmes and technical sessions across India. 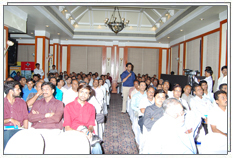 Mr. Tirtha Banerjee delivered technical session on “Waterproofing and Repair Materials” in the Seminar on “Retrofitting and Rehabilitation of Buildings” organised by Indian Building Congress, Delhi on 17th July 2015. 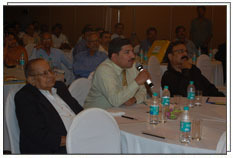 Mr. Tirtha Banerjee and Dr. Prakash Mathur have attended round table technical committee Conference on “Sustainable Buildings” organised by Indo-Italian Chamber of Congress, Mumbai on 21st September 2015. 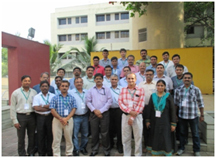 The 12th Governing Council Meeting was held on 21st may 2015 at Corporate Building in Kondivita premises. 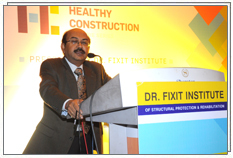 Dr. Fixit Institute of Structural Protection and Rehabilitation (DFI-SPR) has organised following knowledge dissemination workshops and technical sessions in the field “Waterproofing, Building Maintenance and Repairs” in various corporate bodies and institutions across India. 3. 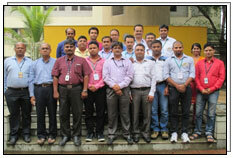 National Institute of Technical Teachers’ Training and Research (NITTTR), Chandigarh. 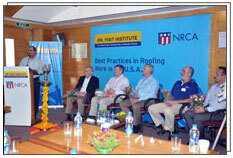 A One Day Training Programme on "Best Practices in Roofing Work in U.S.A."
A One Day Training Programme on “Best Practices in Roofing Work in U.S.A.” was organized by NRCA, U.S. - DFI on 23rd May 2013 at Pidilite Industries Limited, Mumbai. 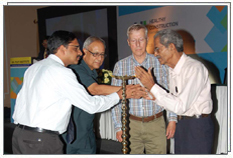 Mr. Nelson – President- NRCA, U.S.
Mr. William Goods- Executive Vice President – NRCA, U.S.
Mr. John Schehl – Executive Director, RISE Inc.
Mr. Bill Steinmetz – OSHA trainer, NRCA, U.S.
Mr. Sanjay Bahadur – CEO Global, Pidilite Industries Ltd.
and more than 30 participants who were 25 top applicators and 8 managers from CC division of Pidilite Ind. Ltd, Mumbai. 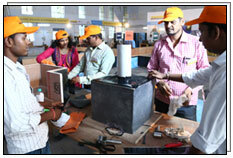 The programme was inaugurated by lightening a lamp by all presentees. 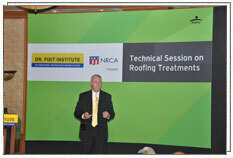 The sessions were taken on different types of Roof Systems used in U.S.A.
Mr. John Schehl emphasized on U.S. Roofing Industry and covered 4 sessions on different roofing systems such as” Energy Efficiency in Roof Systems”,” Single Ply Systems”, “Other Roof System Technologies” and “Flashing Systems and Details”. 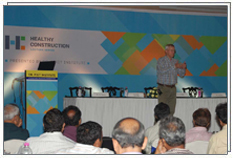 Mr. Bill Steinmetz took 3 technical sessions on “Built-up Roofing Systems”, “Modified Bitumen Systems”, “Metal Roof Systems” and emphasized on “Introduction to U.S. Worker Safety Practices”. 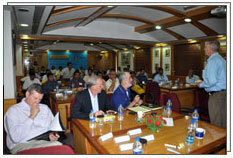 Mr. Jay Paul and Mr. John Schehl visualised on NRCA, India- Vision and Mission for practising engineers, contractors etc. Certificates were issued by honorary guests to the participants. 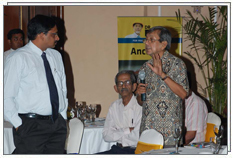 Mr. Padmakar and Mr. T.P. 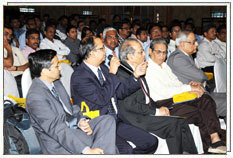 Banerjee expressed Vote of Thanks to speakers and audience. 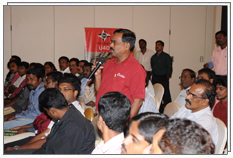 Momento’s were given to speakers by Mr. Sanjay Bahadur and Mr. Jay Paul. 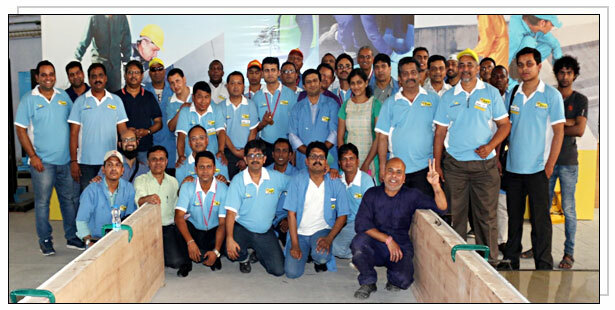 The programme was successfully ended after group photos are taken at the poolside. 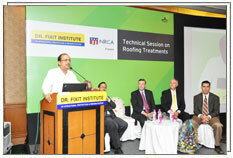 The Institute organized a special lectures on “ Roof Waterproofing Solution for New Constructions on Thursday, the 26th May 2011 at Hotel Orchid, Vile – Parle ( East ), Mumbai jointly with National Roofing Contractors Association (NRCA) USA, a premier professional body and the most respected trade associations and leading authority from United States of America in the roofing industry. 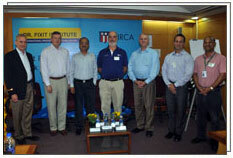 Mr.William Good, Executive Vice-President, NRCA ( USA ), Mr.Paul Apostolos, Assistant Director, NRCA & Mr.John Schehl, Head Education & Training, NRCA delivered the lectures. 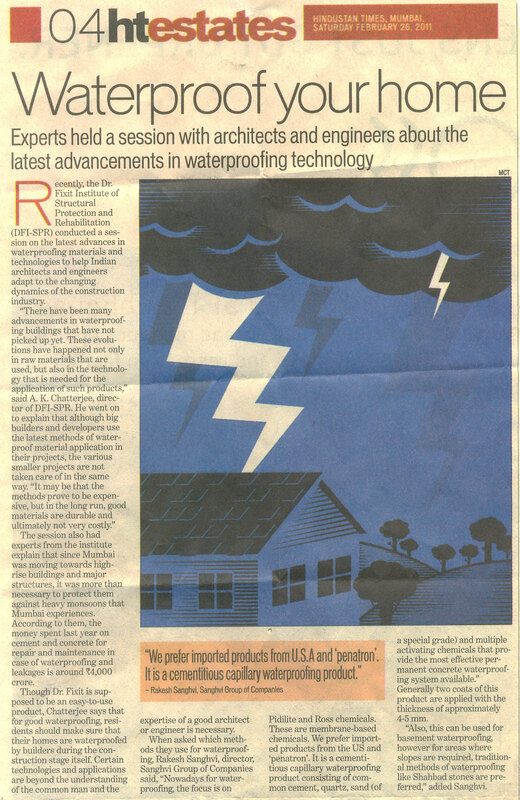 Mr.K.Padmakar, Vice-President, Pidilite Industries Limited explained the problems associated with the conventional roofing systems and materials. 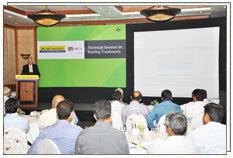 He highlighted the new products developed and introduced by Pidilite Industries in the area of Roof waterproofing particularly for new constructions. 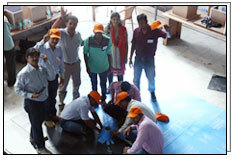 The occasion was utilized to launch the newly developed product of the company namely “ Solyseal “. 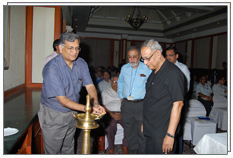 The launching ceremony was inaugurated by Mr.Sushil Luniya , President, CC and by Mr.Sanjay Bahadur, CEO. Leading construction houses in our country like Hiranandani, Rahejas, Ackruti, Orbit Corporation, India Bulls, Oberoi, Nirmal Life Space, Kalpataru, Lodha and many others participated in this event and was represented by their senior executives. 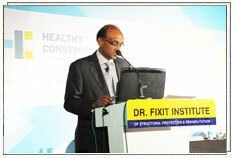 DFI-SPR has recently organized technical seminar under "Healthy Construction Lecture Series" on 4th December 2009 in Chennai with Dr. P. R. Swarup, Director General and Secretary to the Board of Governors of CIDC. 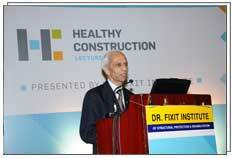 The theme of the lecture was "Repair and Maintenance needs of Concrete Structures in India". 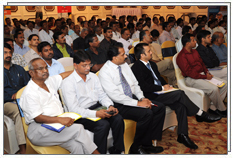 The prominent leading architects and engineers from all over Tamil Nadu attended the evening programme. 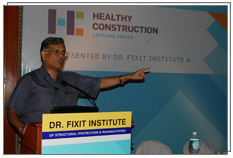 DFI-SPR has recently organized technical seminar under "Healthy Construction Lecture Series" on 20th August 2009 in Ahmedabad with Dr. Sudhir Jain, Director - Indian Institute of Technology, Gandhinagar and an eminent technocrat as the Guest Speaker. 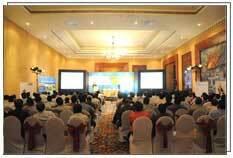 The theme of the lecture was "Seismic Assessment and Retrofitting of RC Frame Buildings". The prominent delegates from the civil engineering fraternity in and around Ahmedabad and Vadodara attended the evening programme. Date: 25th and 26th of Jun 2009 Location: Kolkata and New Delhi resp. 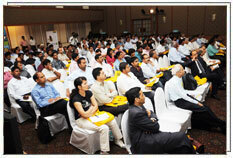 Date: 26th & 27th Feb 09 Location: Banglore & Mumbai resp. 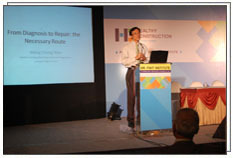 Dr. Fixit Institute of Structural Protection & Rehabilitation conducted a lecture on " From Diagnosis to Repair : The Necessary Route" by Mr. Wong Chung Wan, Singapore, at Banglore & Mumbai, dated 26th & 27th Feb 09 respectively.